The Reserve is an ecological gem with an interesting history. Originally earmarked for agrotechnology, it was discovered by a group of avid bird watchers that the ponds and mudflats were actually a key roosting and feeding site for shorebirds that had migrated for thousands of kilometres. This kick-started a community effort in 1986 with the government and various nature experts working together towards its protection. Through their prodigious efforts, Sungei Buloh was designated as a nature park and officially opened in 1993. A decade on, the groundwork and community support for this wetland area saw it become gazetted as a nature reserve in 2002, the only wetland reserve in Singapore. In the same year, itwas also recognised as a site of international importance for migratory birds, and formally joined the East Asian-Australasian Shorebird Site Network. In 2003, the Reserve was declared Singapore’s first ASEAN Heritage Park. Today, the Reserve remains a wildlife sanctuary for a diverse range of flora and fauna, from mangrove inhabitants to resident and migratory birds such as the Common Redshank (Tringa totanus) and Whimbrel (Numenius phaeopus). Every year, millions of migratory shorebirds escape the harsh winters in the north by braving an arduous journey southwards to roost and feed. The routes taken by these birds are known as flyways and Sungei Buloh Wetland Reserve is situated along one of the world's greatest, spanning from Russian Far East and Alaska to Australia and New Zealand. Because the journey is so long and taxing, rest stops are needed along the way for the birds to rest and feed, and missing one can mean the difference between life and death. The last few decades have seen rapid development and urbanisation throughout the flyway, and the resulting loss of suitable habitats for such stops have caused populations of shorebirds to plummet. For the thousands of birds that reach the Reserve, it is both their haven and home for more than half of the year. In addition, it is also a vital refuelling station for many others that spend the winter further south. To remain as a safe haven for these migratory birds, the Reserve started a bird ringing programme to monitor these birds in 1990. It is one of the first and longest-running bird monitoring programme in the region. Initially, metal rings were used but these meant that information could only be deduced when the same bird was recaptured and the ring read. Subsequently, more visible coloured flags were implemented, allowing the bird watching community throughout the flyway to report the bird when it was sighted. Improving technology has since allowed even more tools to be deployed. Since 2014, radio trackers, geolocators, satellite transmitters and DNA sequencing have been a boon to better understanding shorebird ecology, contributing towards their global conservation efforts. Besides being an important site for migratory birds, the Reserve also has a bird rehabilitation programme in place. In 2015, the Reserve successfully raised and released several Red-wattled Lapwings (Vanellus indicus) that had been found as chicks by members of the public. Today, they can be regularly sighted at Kranji Marshes, where they have decided to stay and call home. The Reserve also focuses on mangrove conservation of native species. The mangrove arboretum was set up in 2015 with the sponsorship from Kikkoman Corporation. Critically endangered species such as the Eye of the Crocodile (Bruguiera hainesii) and endangered species like the Bruguiera parviflora and Lumnitzera littorea among other mangrove species, have since been planted. To cultivate a love for nature and native biodiversity in our young, the Reserve has numerous programmes, from guided walks, craft activities, to hands-on interactive programmes, catering to different age groups. Through the strong support of many corporate partners, these programmes have been able to extend their reach over the years. For example, for more than a decade, HSBC has funded the Young Naturalist Programme to inspire the love for nature in future generations; the Singapore Press Holdings has been supporting the SUN Club Programme, an educational programme tailored for children with intellectual and physical disabilities; and Shell, with Nature Nurtures, a yearly programme that promotes confidence in youths through nature-related activities. 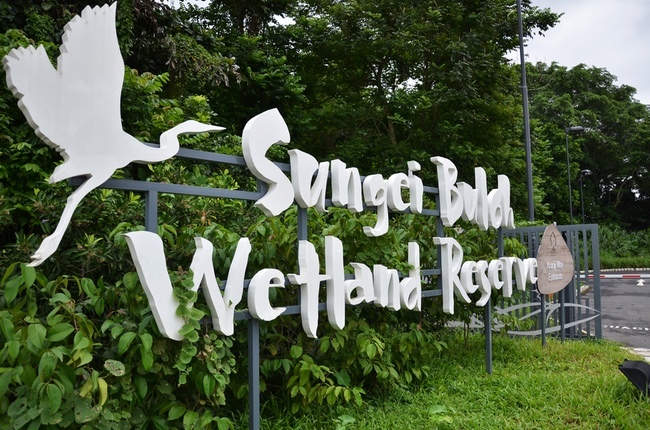 The Friends of Sungei Buloh Wetland Reserve also plays an important role in enabling people to take ownership of the Reserve. Led by volunteer and artist, Mr Tham Pui San, this community includes nature enthusiasts, photographers, birders, and volunteers of the Reserve. Together, they organise various activities and talks to educate and promote the appreciation for the biodiversity found at the Reserve as well as initiate projects that liven up the Reserve’s visitor experiences. Sungei Buloh Wetland Reserve is also the birthplace of the NParks volunteering programme. It started as a ground-up initiative by a group of avid bird watchers in 1993 and has since expanded to the rest of NParks. Today, the Sungei Buloh Wetland Reserve family is made up of more than 250 volunteers! One such volunteer is Ms Kwan Sau Kuen who is in her 60s. A semi-retiree from the shipping industry, SK, as she is affectionately known, has been sharing about the marvels of the Reserve with others for more than 20 years. Spurred by her love of the Reserve, she regularly conceptualises new guided walks and conducts training workshops to groom the next generation of guides. Her greater objective? To encourage more people to learn about the Reserve. Equally passionate about nature is 16-year-old volunteer Jonathan Lee Yi Xian. For the past few years, this student has been leading the public on guided walks during the weekends and when he is not busy with school. He enjoys the opportunity to interact with the public and to gain a better understanding of how people relate to nature in Singapore. The Reserve continues to play an important role in the conservation and protection of the diverse wildlife that call Sungei Buloh its home – from continually building relationships and exchanging information with the various wetlands around the world, to conducting continued research on shorebird and mangrove ecology. In turn, the objective is to have the wildlife better understood and appreciated by more people, to understand that this is a magnificent yet fragile habitat they live in. Ultimately, Sungei Buloh Wetland Reserve should remain a place all Singaporeans cherish and love. Volunteers are truly gems; from conducting workshops and guided tours to helping out with conservation surveys, Sungei Buloh Wetland Reserve will not be where it is today without the help and contributions of volunteers. Click here to join in our conservation efforts. Learn about the diverse plants and animals found in the various habitats of Sungei Buloh Wetland Reserve. This weekly guided walk is suitable for everyone, including families with children. To register, two Fridays before the scheduled date, click here.